Many of the minifig styles from Town Theme are complete, including most of the styles from the current Town sets. There are too many to show studies of each individual minifig, but most of the different styles appear in the images below. 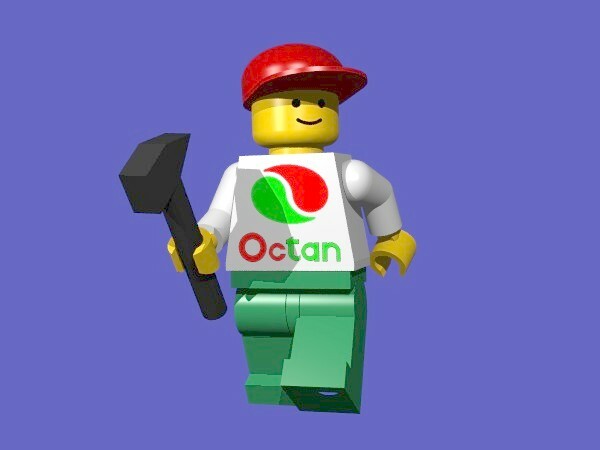 Look for the Octan worker, the trucker, the leather jacket guy, the blue and red workers, the chef, the butler, the policemen, the striped shirt guys, and the businessmen. You might also spot some of the made up styles, including the NIN fan, the anarchist, the victim, the one that looks suspiciously like me, Homer Simpson (doh! ), Andre Agassi (as he appeared at the 1995 US Open) and the French guardsmen. Hint: I'm the one with the suitcase. 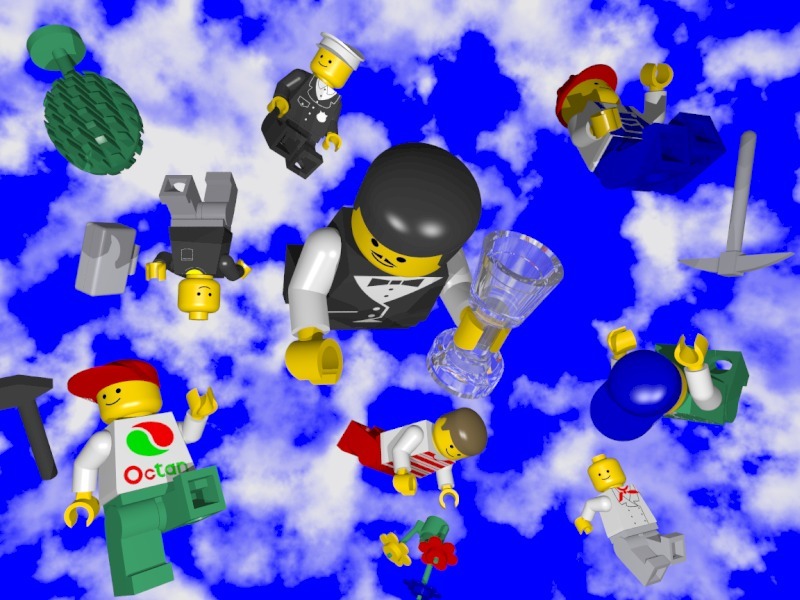 Most of the early work was on scenes which used minifigs, but no other LEGO elements. This reflected our basic interest in posing thousands of minifigs doing something interesting. 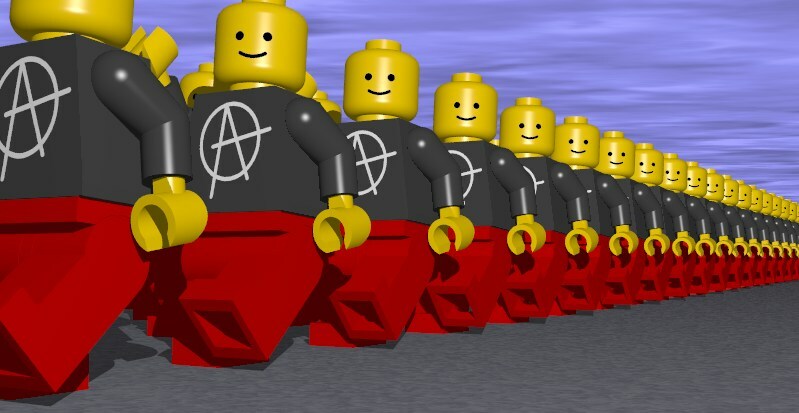 Here you see the Anarchy March, as rendered by Rayshade. Jeremiah Johnson came up with the original concept and planned the layout of the image. This predates even the posing tool, so this was all done by hand. 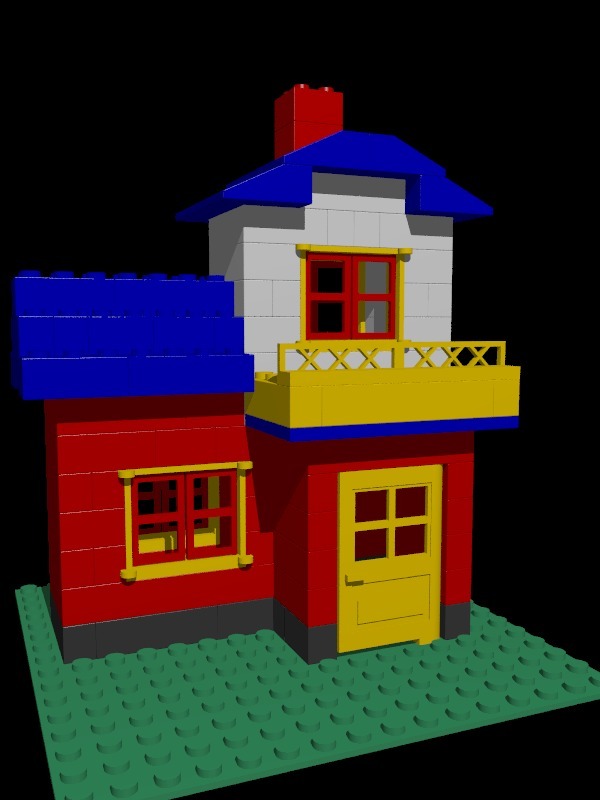 This version was rendered on October 26, 1994, and the minifig model has quite a number of errors that have been corrected since. 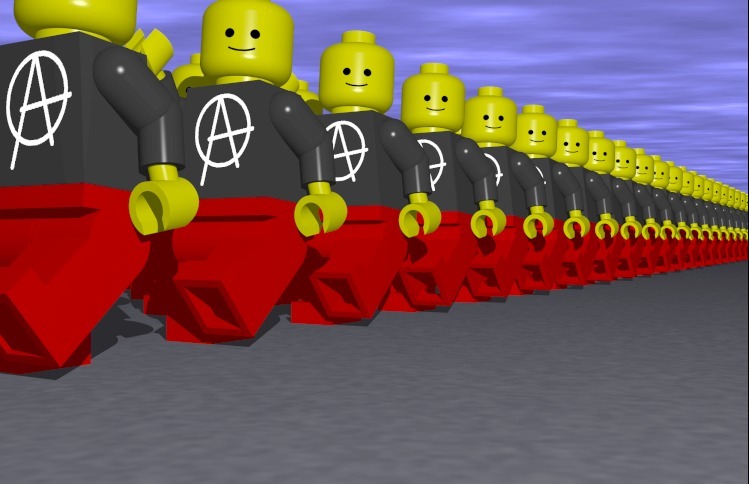 The development of the model was moving rapidly at this point, and several of early images in the Anarchy March series feature minifigs with spheres instead of hands, no "crotch" piece and no holes in the legs. The odd aspect ratio (17x11) comes from the size of the paper I wanted to print the finished image on. With the printing process in mind, this was rendered at 150 dpi, or 2494x1613. Don't worry -- the JPEG shown here is only 1/3 that size. Update! I just realized that I had converted this image to POV format! This is a much better looking version, except for the sky and ground textures, which I painstakingly recreated from the Rayshade version. Notice the improved color, more accurate dimensions and improved detail. Imagine my surprise when I found out that topic for the January 1995 Internet Raytracing Competition was Toys! And imagine my surprise when January 25th rolled around and I still hadn't done anything for it! With only minifigs and their tools to work with, I was pretty limited in what I could do. 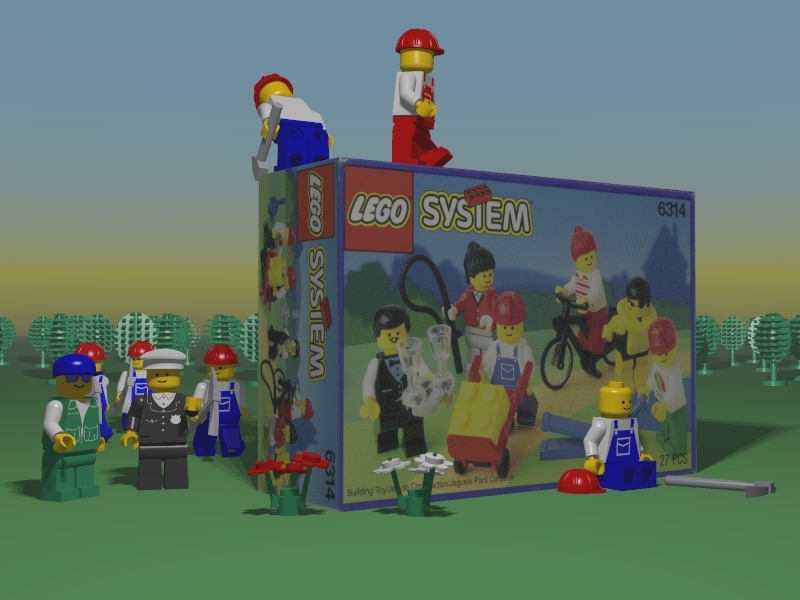 Initially I was going to have the 6314 City People standing in front of their box, but when I realized I didn't have the necessary imagemaps and objects for all of them, I decided to show them opening the box. From left to right, on the ground, you see the truck driver who delivered the box, a policemen chatting with him, three workers with pickaxes and a fourth worker taking a break leaning against the front of the box. On top there's a worker with a hammer, and a red worker (the foreman) surveying the situation. The box is composed of panels scanned from an actual box, which I disassembled carefully and scanned. The background is just a clump of LEGO trees which were placed randomly by a program I wrote that was supposed to generate crowds. I like the parallel between the picture on the box and the image itself. The image you see here was re-rendered from the same source recently in order to take advantage of the corrections and enhancements that had been made to the library of POV-Ray objects and imagemaps. The original image was entered in the competition and place second, behind an image of a crane build out of erector set pieces by Mark Vernon. 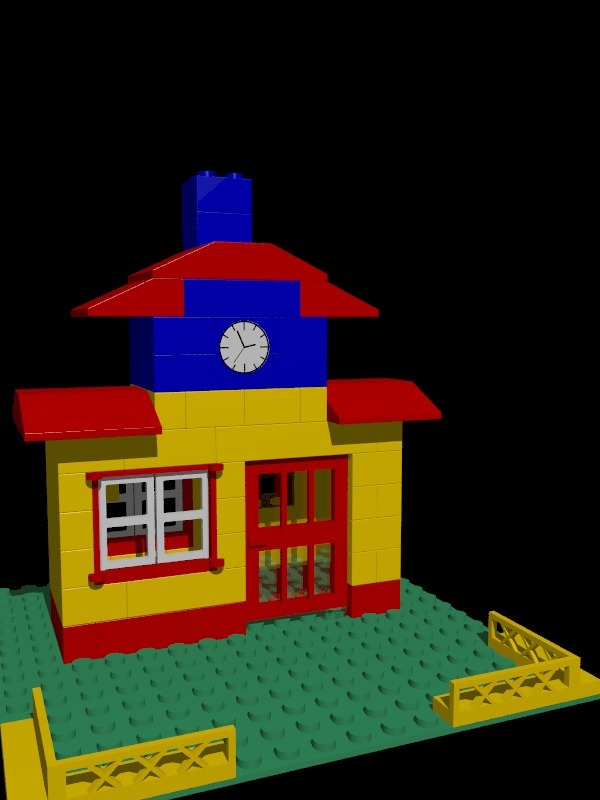 For a while I planned to enter LEGO scenes in every competition, but then I got a job and was distracted for several months. Look for an entry in the October competition, though. After using the January contest image as my backdrop at work for several months, I created this image specifically to be a workstation background. 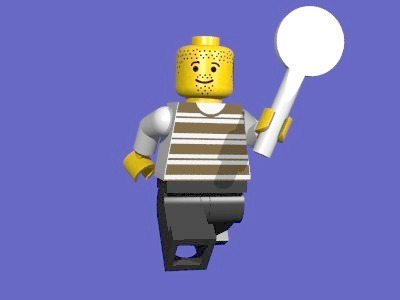 I just fired up the poser and started trying to make minifigs that looked like they were falling through the air, and mostly by chance decided to put the butler in the center of the image carrying a wine glass. From there I placed the minifigs around him at various distances, and filled in the gaps with assorted junk. I'm not really happy with the lighting, and I may return to this image and try to eliminate the more obnoxious shadows. Mostly they're hidden by my xterms anyway. From left to right, there's an Octan worker, a minifig that looks suspiciously like me, a policeman, a butler with a wineglass and a striped shirt guy. The last three minifigs on the right are (from top to bottom), a worker, a trucker and a chef. The junk consists of a tree, some flowers a suitcase, a hammer and a pickaxe. This probably counts as my "LEGO displayed at work," even though in the two months that it served as the backdrop on my workstation, no one said anything about it, except my manager, who noted that her sons had "some of those." I guess I need to make a mobile with the same figures and suspend it from the ceiling if I want to get people's attention. Before I was distracted by buildings (check out the Train Theme), I did some work on the vehicles I had handy. These are actually just the last test images I rendered before losing interest, so they aren't perfect. 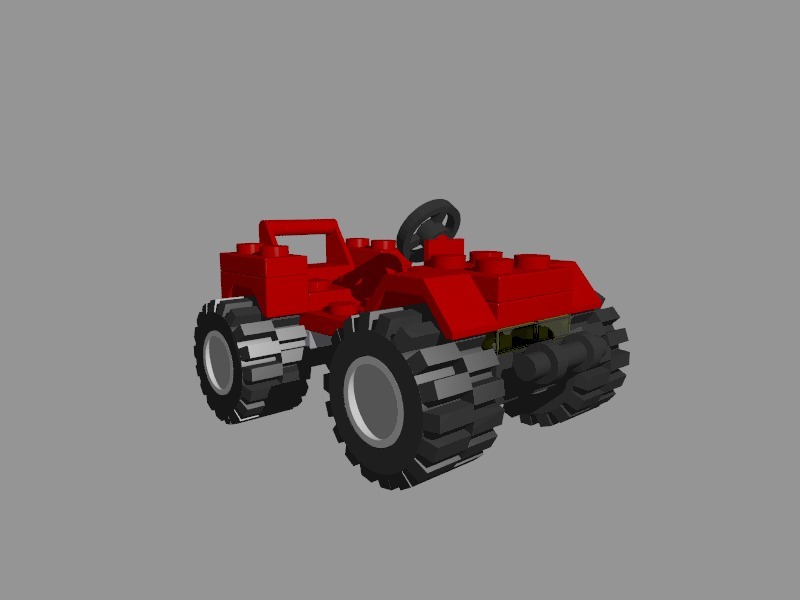 This is the 6514 Trail Ranger. I don't really have anything to do with the car now that it's done, so it sits waiting for a big Town project involving lots of roadplates and Town buildings. This is the small car that is part of the three-pack 1720 Cactus Canyon. There's not much special to this vehicle, though I hope to finish the other parts of the set (a tiny boat and a larger truck) since they're all nifty additions to the Town vehicle pool. The most impressive buildings done so far are models from the 4554 Metrostation, but I have modelled some of other small buildings in the instruction books I had handy. This small house is the secondary model for the 1708 Blue Ribbon Bucket. It's not much to look at, really, but it did get me to model that style of front door. The house on the right is the main model for the 1879 Basic 5+ Bucket. Once again, it's biggest feature is that it was motivation to do that particular style of door. Should come in handy on the 6286 Skull's Eye Schooner! There are several more scenes in progress, at various stages of completion. Watch this space for additions. Some of them are just waiting for me to model the objects (mainly hair and hats) that they need to be complete. I'm not going to put many of the partially completed images up here, since it would ruin the effect of the finished scene. 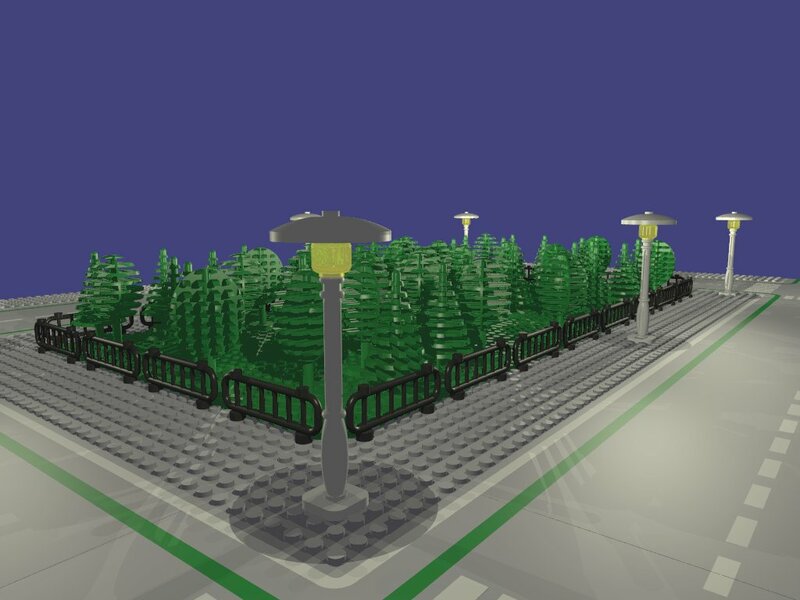 One of the scenes I started was a city park, which I abandoned when I decided that LEGO trees were so much shorter than the lampposts that it just ended up looking goofy. 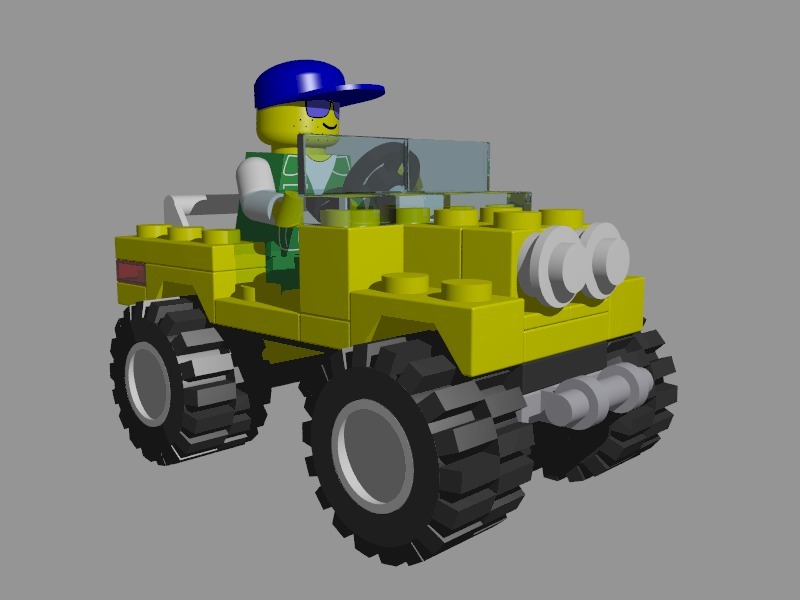 This one is going to be shelved until I write a program which can generate trees out of the various tree components that LEGO has created for newer outdoorsy sets. 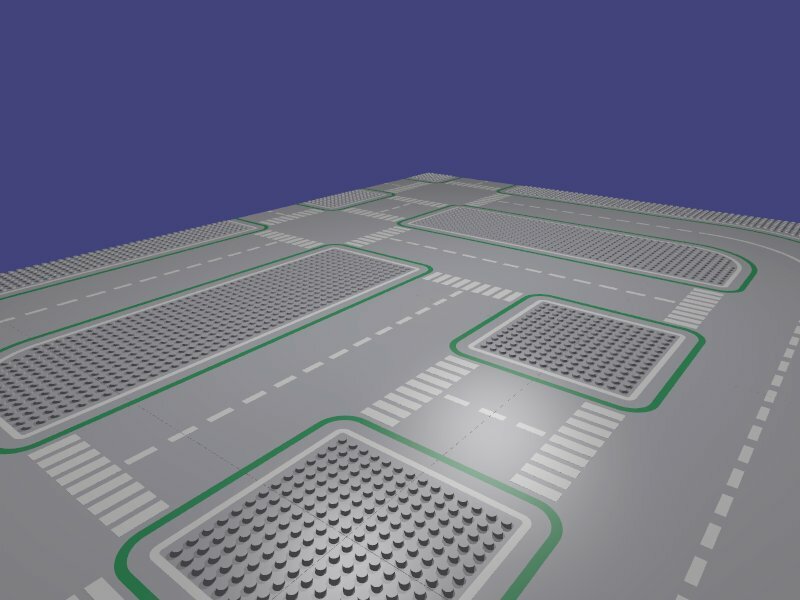 Meanwhile it does show off some roadplates, and it demonstrates that actually lighting a scene by placing a light source inside a streetlight gives decent nighttime-like results. 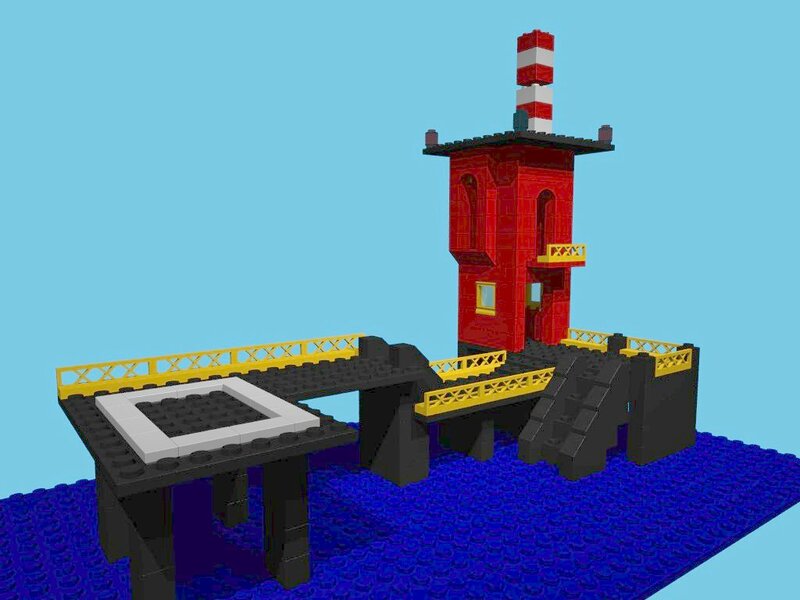 The 575 Coast Guard Station was my very first LEGO set. My original LEGO collection is long gone, but Galen Tatsuo Komatsu was kind enough to loan me the instructions so I could photocopy them. Ahh for a modern set with so many 6x15 black plates. This building is still waiting for me to model some objects that I no longer have, like the antenna, flag, and propeller mount. Don't forget to visit the Train Theme for more Town related images.